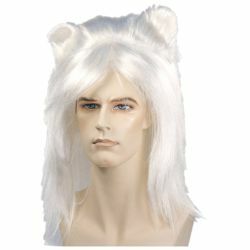 The cat wig with ears is perfect for creating the character of a cat for either Halloween or for our directors who are producing the show cats. The wig features a long wig with a portion of the hair styled into the shape of ears. The cat wig is available in black and white, brown and auburn, brown and blonde, brown and white, or white. The wig features an elastic band for a comfortable and secure fit to almost any head size. Don't forget a wig cap for a more secure fit and a wig stand to help organize your wigs and keep them neat, tidy, and extend the life of the wig.